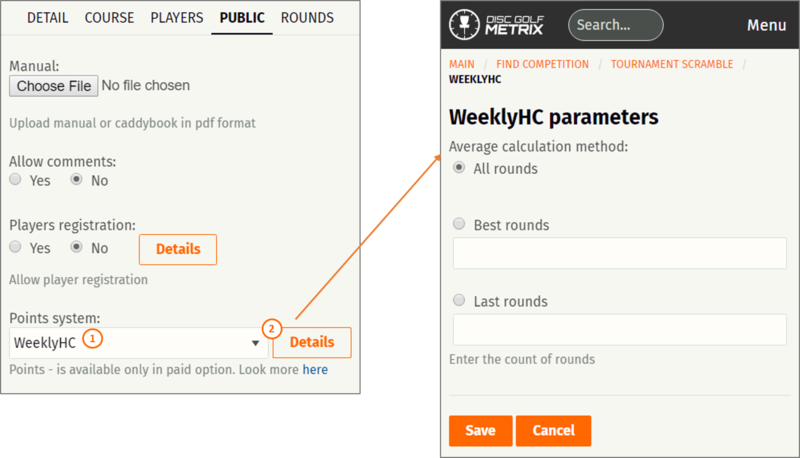 Handicap calculation based on average results for weekly competitions. Simple and easy handicap system that uses average scores of previous competitions as handicap for the current competition. For example, if a player has participated in two previous weekly competitions and played total scores of +6 and +10, then player's handicap for next competition would be 8. And handicap in this case means that 8 throws would be substracted from score of the third competition for this player. all rounds - average of all previous competitions. These settings can be found from Edit competition --> Public --> Details after selecting the Points system (1) and saving and then clicking Details (2).